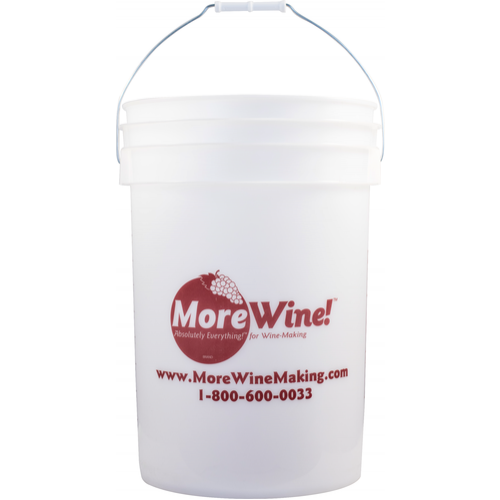 A food-grade six gallon plastic bucket perfect for all kinds of home beer or winemaking activities. Plastic buckets are often used as a fermenter, bottling bucket, or even sanitizer bucket. We go through thousands which helps keep our price down. If you want to use it as a fermenter you will also need to pick up the optional lid, stopper, and airlock. This bucket is also available in a version that includes a spigot (see recommended products below). If you use this plastic bucket for fermentation be sure to use care when cleaning. Do not use any abrasive pads that would scratch. Once you get a scratch in a plastic bucket it is very hard to sanitize. This is also why we don't recommend storing equipment in a bucket between uses as a fermenter. A hot PBW soak is often a perfect way to clean a bucket, followed by a Star San soak for killing bacteria. Bucket has external volume markings up to 5 gallons. Buckets are translucent and do not come with lids. Buckets are not designed to hold pressure. Lids are not gasketed and so do not always form a perfect, airtight seal. Not intended for long-term storage. I need some new fermentation buckets..
Don't forget the lids; I did. They are separate. It’s a fantastic bucket for cleaning and storing my sanitizer. Brew Great Beer not Bad Backs! I find these much easier to work with then carboys which are at the very least heavy and at the very worst deadly hazardous. There’s more beer buckets come with a very nice easy sealing flexible lid that last a long time, the handles are strong and their new spicket’s are wonderful with the trub trap already built in. Great buckets.price was right too!! This bucket is not nearly as opaque as my last one - while fermenting I could see the krausen without popping the lid (it helped if I used a flashlight). This was a big win for me, I just had to keep it covered to protect it from light. I did manage to scratch the inside somehow (just a bit) and was being very careful, so not sure yet re: durability, but so far so good. It accels at bucket type things. The website specifies that the bucket is food grade up to 180F. I poured some hot tea into it to cool down at around 160F, and I immediately smelled melting plastic. In addition, the walls of the bucket became soft to the touch. This is definitely not rated to the numbers provided by the website, and it doesn't seem to be made out of HDPE, or a higher quality plastic, which will not melt up to 249F. I don't ferment in buckets so I just use mine for sanitizing and washing. It works fine for this purpose. Have a couple of these and they work great. Use them for sanitizing and bottling. They stack well and are great for storage. I have three sets for fermenting. I've never had a seal or bad taste problem with any of them. 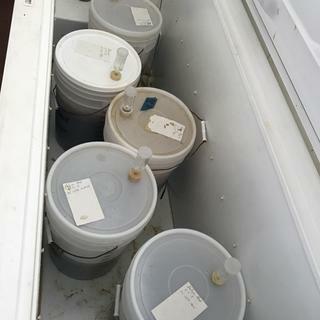 I have had a top blow off twice, due to very active fermentation (and now use the SSA with locks), but I think these buckets generally work well. Use it for my wine and beer, no issues. Be sure to use a blow off tube if doing beer in this however, or you may come home to an unsightly explosion and mess. I have four of these that I use for everything but fermenting and I try and replace them every year. For the money you can't go wrong. Good Bucket. but I don't ferment in it so I cant speak to that. I use these to sanitize and store all my smaller equipment when not in use. Has the gallon markings and they are translucent which I prefer. The only downside I have is the price. I haven't had any problems with sealing like some people have reviewed but I use my own lids that have a rubber gasket so maybe that is the diff. I like that the bucket is a bit translucent. Buy the lid too, it fits well. I use the bucket mostly for cleaning. With a different lid it can be sealed and used as a fermenter. Works very well initially, but I eventually turned this into my grain mill bucket. This is the 1st time I've been disappointed in a morebeer order. I have to admit I didn't read the product description/reviews or I wouldn't have bought a fermenter that doesn't have an airtight seal. It definitely didn't seal, and I didn't get airlock activity. Apparently if you buy this, you don't need to bother with an airlock, since it doesn't seal anyway! If you're buying this bucket for measuring liquids, or moving stuff, go for it. For brewing beer these buckets are better than other buckets. I purchased another bucket from an unnamed home-brew shop and I wished I bought another more beer bucket. Although this particular one doesnt have a spigot, the ones that do are great, they don't leak and they are easy to turn on an off. Its the little things that make for an easy brew day. I enjoy these plastic buckets because I can ferment in them or use them to clean my other equipment. Easy to clean and cheap to replace. I use this bucket for everyhting! 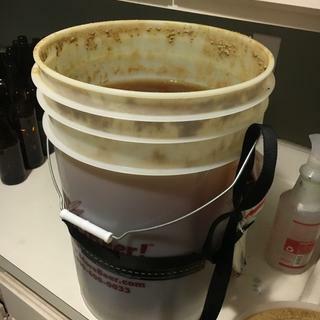 I have 5 different fermentation vessels, this bucket is my preferred fermentation tool for homebrowing. I love it because it's small footprint, easy to open lead, light with and durable volume scale print. This bucket is well built, I use them for many things from sanitation to fermentation. Nice bucket, but lids leak like a sieve. I own 6 of these. It doesn't bother me because I know how my ferments are going, but often times the bubbler wont even bubble because the lip of the lid leaks so bad. I purchased this as a back-up fermenter but was not happy with the seal. I instead use it for mixing sanitizer and a over flow bucket to place bottles in when filling bottles. 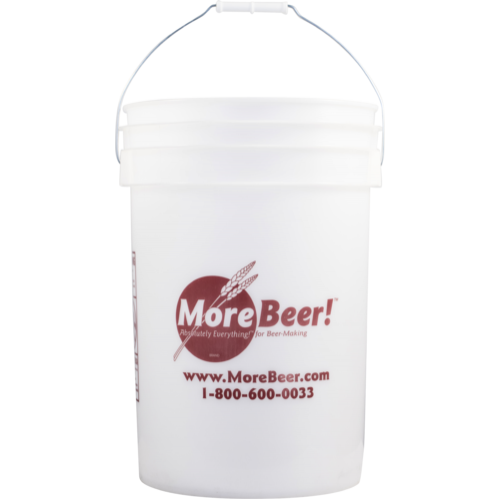 I've purchased several of these buckets from Morebeer! and they are better than the others for 2 reasons. 1-The lid comes on and off more easily than other buckets. 2-They are more translucent than other buckets. They are graduated to check volume and the handle makes it easy to move around. I like buckets!!! I agree that these are nice buckets but they were $8 just two years ago. Why are they $13 now? I am going to have to go with a different alternative when I want new buckets. I have had many buckets from many vendors, and these are the best I have found. They are slightly translucent so you can see the contents inside which is nice so you can determine volumes, and they also have a volume scale up the side. They can easily hold the weight of 6 gallons of fluid. When they have been used a few times and are questionable for fermenting, add a Gamma lid and they are perfect for holding grain so you can buy in bulk and save big money. There's really no cons to this bucket, the price is good and I will continue to buy them as I need them. Extra buckets on brew day always come in handy. The 6 gal size is the way to go. Durable product, holds up well. I no longer use these for fermenting beer, but use it to store my sanitizing and cleaning solutions and keep all my gear together. And, if I ever ran out of glass carboys, then I could do use it as a fermenter. I have good seals with my two buckets and lids. Great product. I have 4 of these. They are fine for primary fermentation. Easy to use , easy to clean, and opaque so light is kept out. Well suited for their task. 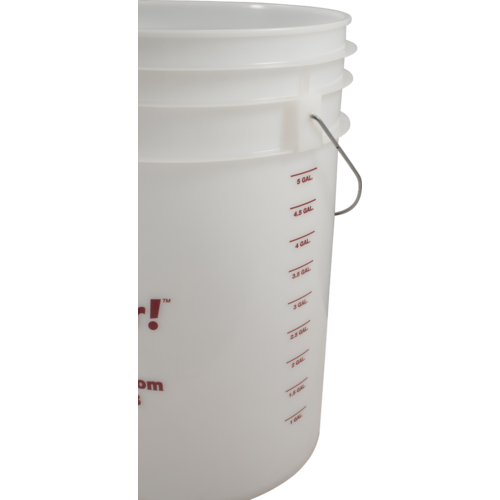 For sterilizing, large volume measuring (like calibrating carboys), and generally hauling stuff, this bucket does the job. It is solidly made and resists sterilizing solutions. A well made Bucket, good for bucket things. The lid you can buy with it does not have an airtight seal, so I can not say what exactly this bucket is good for in terms of long storage of grain and fermentation conditioning stages. Very handy. Food grade. Good price. Use the gallon marks every brew. Its a bucket that I use for my primary.... I haven't had a problem yet. Plastic bucket !! I searched all over locally for 6 gallon buckets to store my grain in. These allow you to store a 50 pound sack in 2 buckets. Thank you Morebeer! Good value bucket, but the plastic is thinner then my current fermenters. Indispensible item while brewing - measuring the grains, milling the grains, emptying the mush tun. Great to have a bucket of sanitiser ready during the process. THE BEST BUCKET MONEY CAN BUY!!!!!!!! I have several more beer buckets and they are amazing. I have had some as long as 07 and there are no residual smells, stains, scratches, I will use these until they fall apart, which seems like I will be brewing for many many years to come! Really enjoy the slightly translucent walls that let me see the water level inside a little easier than other fermenters/buckets I've used in the past. All my carboys were full so i bought one of these to use as a fermenter. I couldn't get the lid to seal well so i never saw any movement through my airlock (even with 20 lbs of weight on the lid). Nevertheless the batch turned out great! what can be said other than it holds wort very well and is easily cleaner.